Mark Barden, father of Daniel who was killed at the elementary school shooting in Newtown, Connecticut, holds a photo of his three children during his speech to the opening session of the state's Democratic Convention, in Melville, N.Y., in 2014. 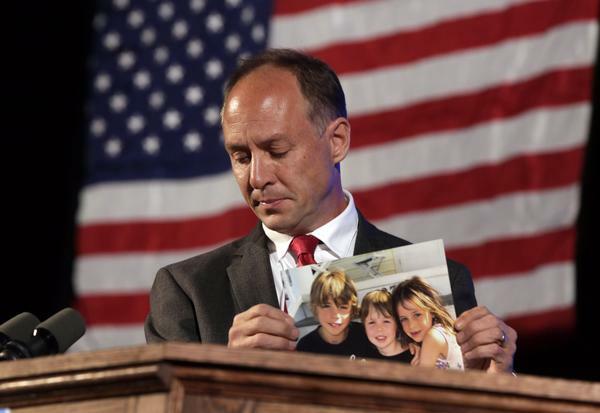 Mark Barden lost his 6-year-old son, Daniel, in the 2012 Sandy Hook Elementary School shooting, which claimed the lives of 19 other children and six educators. After the shooting, Barden co-founded the advocacy group Sandy Hook Promise, which seeks to prevent gun-related deaths through gun violence prevention programs and policy change at the state and national levels. With the five-year anniversary of the tragedy on Thursday, Sandy Hook Promise recently released a public service announcement called Tomorrow's News. Reporter Davis Dunavin spoke with Mark Barden on Tuesday about the ad and his work with the organization. Below is the PSA and a transcript of their conversation. How did you feel when you first saw this new PSA? It should be uncomfortable to watch. Gun violence, gun-related tragedies, and certainly school shootings, there’s nothing comfortable about any of that. There’s such a valuable lesson though in that, you know everyday has the potential to be the day before. And with that comes the potential to make an intervention to prevent that tragedy from happening. When folks are trained to recognize those signs, they can make an intervention to direct that person to help, before that person picks up a firearm and hurts themself or somebody else. What kind of an effect or a legacy do you see these PSAs and the associated work that you’ve been doing, what kind of an effect or legacy do you see this having? We now have anecdotal evidence from the field that we have indeed prevented school shootings in the planning stages from students following the model and taking the next steps to avert a tragedy. I know of two incidents in Ohio where a horrible tragedy was being planned and in the final planning stages, and in one case an eighth grade student who had been trained in the Say Something program followed the model and was able to make an intervention and stop something in the final planning stages before it was carried out. We met last year and we talked about doing this work for Daniel. What does this five years of work mean for you and for Daniel’s legacy? The work that I’m doing with Sandy Hook Promise is a very special, deeply personal, very valuable, and genuine way to honor the beautiful spirit that my little Daniel was. He was an exceptionally compassionate little boy. He had a very developed sense of awareness, of others. I just feel that I owe it to him to continue that for him. And I can do that through the work that we do with Sandy Hook Promise. I can look out for other people and save lives in Daniel’s name. Nothing takes away the pain of losing my sweet, little boy. Nothing. But this is a way that I can at least try to do some good and reach others in a positive way in honor of my little Daniel. In the five years since the tragedy and really in the past few months with Sutherland Springs, Las Vegas, we’ve seen so many of these mass shootings. What do you think when you see these seem to become almost an everyday occurrence? It’s hard for me to lump them all into one category. I kind of take each one of them very personally and one at a time, and I kind of go through my own process of grieving for the victims and the families of the victims, knowing all too well the journey that they are embarking on. I just feel such a deep remorse and connection with these people. And yeah, it’s very easy and I think natural to feel defeated when I invest every fiber of my own personal resources into this work, into preventing that from happening and then to watch it happen with increasing frequency is…it’s frustrating, it’s discouraging, it’s heartbreaking. Then I have to recalibrate my psyche and remind myself that we are having a positive impact, and it is happening less because of the work that we’re doing. We are preventing it from happening, and we will continue to grow and save more lives as we continue to grow in scale. So I have to remind myself of that in the midst of these ongoing tragedies. You have a community of families and survivors, I imagine that you must have these people who you can turn to for support as well. Yeah, I do. I feel I do, and I hope that other survivors and communities of survivors would feel that they could turn to me as well. Where do you see your work ten, 20 years down the road? We are looking at this through a multigenerational lens. Social change takes time. We liken our work to the great work that’s been done with marriage equality, drinking and driving, or recycling, or all the way back to civil rights. You know, these are all movements that have seen tremendous progress, all works in progress. You know, we’re not all the way there with any of those, but with the work that we are doing, we are training people how to recognize the telltale warning signs and take the next step. And there are so many different ways that folks can join us and support us and help us do that great work, and continue to grow and save more lives.